12 tried and true apps to alleviate your child’s boredom while waiting at the doctor’s, restaurant, etc. Waiting isn't exactly fun, but it's especially terrible when you have kids in tow. This is where an iPad can come in handy. Here are 12 of the best kids' apps to help you kill time and keep your little ones happy. Fiete Hide and Seek is a charming peekaboo game that will delight young kids. As kids play, they can explore beautiful landscapes to discover hidden surprises. Because the levels are randomly generated, kids can always find something new every time they play. The app is also a great way to introduce kids to 40 unique animals. In Comomola Planets, kids drag slices of terrain to populate barren planets and bring life to the galaxy. This modern-day jigsaw game challenges preschoolers to hone their reflexes and hand-eye coordination. With 30+ planets and 100+ unique pieces, kids will have lots of fun discovering new surprises. Car Kit is a virtual playset in which kids can build immersive little worlds for their tiny vehicles. After setting up their toy world, they can hop in into one of their cars and see what it's like to drive around in first-person view. The app is great because it's easy to use, safe for kids, and doesn't require any reading. Highly recommended for ages 3-6. In the gorgeous Gruffalo: Puzzles, kids play against or alongside Gruffalo and friends in 6 mini games with 3 difficulty levels. The easiest levels are suitable for ages 3 and up, while the hardest levels are challenging enough for ages 7-8. Highly recommended for fans of The Gruffalo. Mother Goose Club is a subscription-based service which provides curated videos, games, and books based on an award-winning YouTube show. The contents are entertaining and appropriate for small kids, and they can be downloaded to your device for offline viewing. Navigating the app is easy, and the app has proper safety measures to prevent kids from making unwanted purchases. Sago Mini World puts 20+ kid-friendly, award-winning games in one convenient app. You can pre-download the games for your kids to play later without WiFi or internet. With exclusive content updated monthly, this app is sure to provide endless hours of fun for curious kids. Nampa Forest is a collection of mini games with no specific rules or objectives. Instead, kids discover silly animal friends, funny surprises, and lots of disco dancing. There isn't much you need to do except to tap and drag, which makes the games suitable for ages five and under. Petting Zoo is an interactive picture book that lets kids swipe and tap on pictures of various animals to see how they react. It's cute, witty, and fun for all ages! Every child is an artist, and this app helps them create their own artwork. They can choose a blank canvas or build upon existing templates, use various painting tools, and add stickers and backgrounds to their drawings. When they are happy with their work, they can show it off in customizable in-app gallery. Fuzzy House combines the practicality and interactivity of a mobile app with the charm and familiarity of a traditional toy, to create a playful dollhouse for a wide range of ages. The open-ended gameplay allows kids to take control of their playtime, and encourages creative exploration. PlayKids is a subscription-based service that gives kids access to several popular TV shows for kids, such as Pocoyo and Sesame Street, plus several educational games and videos. Parents can download the shows for offline viewing, and set the videos in "baby mode" to prevent kids from leaving the app. New content is added periodically. 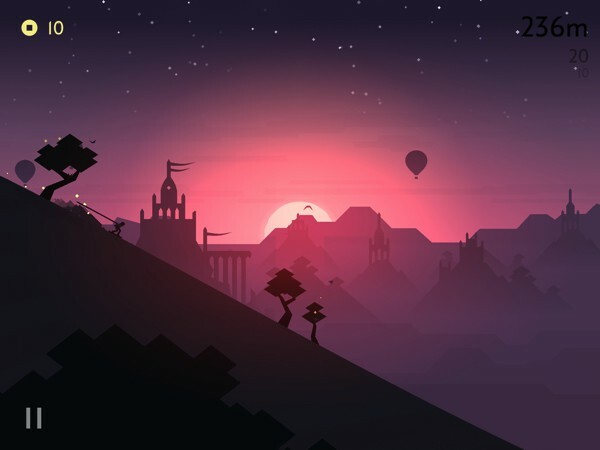 Alto's Odyssey is a gorgeous endless running game in which the player controls their character across dynamically generated sand dunes. Though it's not specifically made for kids, it's wholesome and easy to learn. If your kids are still trying to get the hang of things or often get frustrated when they crash, you can start them off with Zen Mode, which allows them to play endlessly without worrying about making a mistake.